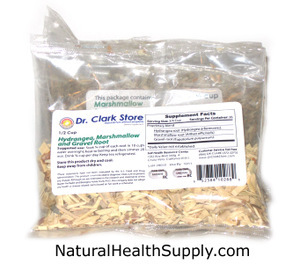 Hydrangea (Hrangea arborescens), Marshmallow (Althea officinalis) and Gravelroot (Eupatorium purpureum) are individually packed loose herbs in 1/2 cup (35 grams) quantities, guaranteed pure and potent from the Self Health Resource Center. Suggested Use: Soak 1/4 cup of each root in 10 cups water overnight, heat to boiling and then simmer 20 minutes. Drink 3/4 cup per day. Keep tea refrigerated.